Gold is moving in low levels due to the possibility of the rate hike by the Fed. It is also under the influence of the trade war between the US and China and the European Union. 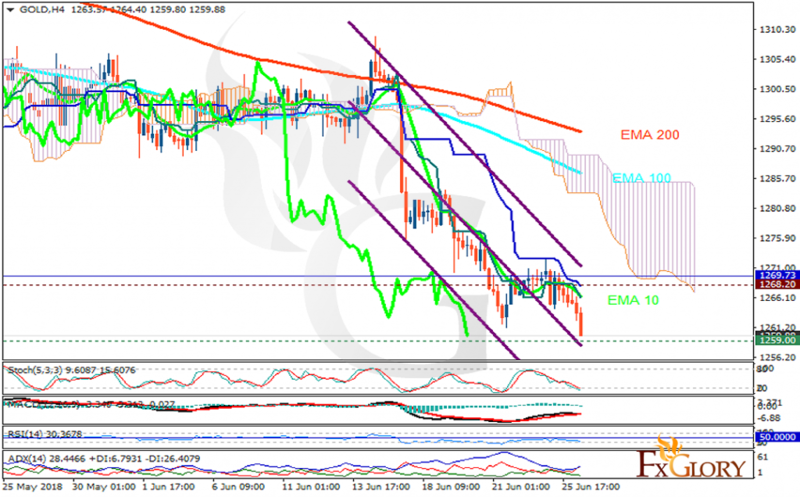 The support rests at 1259 with resistance at 1268.20 which both lines are below the weekly pivot point at 1269.73. The EMA of 10 is moving with bearish bias in the descendant channel and it is below the EMA of 200 and above the EMA of 100. The RSI is moving in oversold area, the Stochastic is showing downward momentum and the MACD line is below the signal line in the negative territory. The ADX is showing sell signal. The price is below the Ichimoku Cloud and the Chinkou Span. The Tenkan-sen and the Kijun-sen are both showing a downward trend. Short positions are recommended towards 1257.